When it comes to automotive care We are NOT like anyone else. Excellent auto care company. Highly recommend them for all service needs. Past experience of servicing our vehicles ranging from Jaguar XJL, 68 Mustang Convertible, F-250 Turbo Diesel, and several work vans. Fair pricing and quality workmanship. Estimates provided prior to work performed. No hidden cost or surprises!! 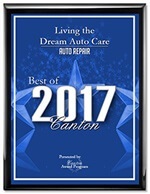 At Living the Dream Auto Care, we don't just say we're different from other shops — we prove it with every repair we do. Our mission statement is to provide you the very best of all worlds: auto service that's as expert as you'll find with any dealer, but with more reasonable prices and a personal touch the dealer can't deliver. At LTDAC, we are the dealer alternative for auto repair and service in Canton and the surrounding Massachusetts areas. Have a recurring or tricky issue with your vehicle? We're the problem solvers. We know exactly how to fix that troublesome issue and take that problem off your mind. But we don't just focus on fixing problems: We take great pride in delivering amazing preventive maintenance service. We treat every vehicle like it's our own, so we do everything we can to ensure you can travel to your heart's content — safely, efficiently and economically — without breaking down. Do what you do so well that when people see you do it they will want to see you do it again. They will bring others with them to show them what it is you do. The key then is to offer a good or service that gives people what they want and makes them happy. Do what you do so well… And when you do this you don’t only compete, you create! Because we stand behind every repair we do, we offer a lifetime warranty on hard parts and labor, and we also warranty brake jobs and similar services for a minimum of two years or 24,000 miles. We can do that because we know how to get it right the first time.